A classic Italian salad made with dry or stale bread that has been moistened, as a key ingredient of this salad. 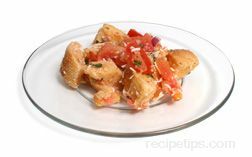 Although there are many variations, some of the most common for Panzanella include bread softened with water, olive oil, or tomato juice as well as some recipes that allow the bread to become dry and crumbly rather than soft. Additional ingredients many include any of the following: basil, tomatoes, cucumbers, onions, peppers, anchovies, olive oil, and seasonings.